Looking for a Bora Bora photographer? We can highly recommend Bora Bora Photo & Video. On our June vacation we chose Stephan Debelle, from Bora Bora Photo & Video, for a Bora Bora photo shoot at our resort, and extended it into a photo lagoon tour with lunch on a motu. Stephan and his assistant Bonnie made the whole experience fantastic fun. We brought home a precious collection of romantic photos; plus unique under-water lagoon photos, proving that we went swimming with graceful sharks. What makes Bora Bora Photo & Video Unique? Stephan doesn't merely have top photographic equipment that he knows how to use. He also has exceptional people skills. He invites clients to relax into splendid moments of being their best selves. Then he steps back to create unique photos that match their style and personality. Stephan's philosophy centers around always giving clients a 100% experience - even though some days will be better than others for taking photographs. He told me not to be afraid to make any small requests. He knows that many vacationers have saved for years to come to Bora Bora, so his focus is to give them just what they want. Bonnie, who assists on photo shoots, has an eye for detail, is naturally intuitive, and fully understands a woman’s whims and needs. As an ex flight attendant, she knows all the details that make the difference for immaculate presentation, and steps in as necessary to ensure that the photos will be cherished. Bonnie is also a darling at pampering people, and was an invaluable hostess and helper during our time in the boat on the Bora Bora photo lagoon tour. Stephan speaks fluent French and English and lived in the United States for many years, so he understands the nuances of several cultures. Bonnie was based in Hong Kong before being lured by the world's most beautiful island; so is fluent in English, Mandarin, and Cantonese; plus is accustomed to relating comfortably with folk from all corners of the earth. Bora Bora Photo & Video offers an exceptional Aqua Photo Tour that you can't find anywhere else! Stephan, who is a professional diver, takes extraordinary under-water photographs. This is not a full circle-the-island tour, instead we had close encounters with the local sea-life at two of the most wonderful spots around the island. Enjoying the best Bora Bora activities on a private tour is a privilege, as the only crowd you'll be part of will be the fishy kind. We discovered that there's no better way to create memories on a Bora Bora vacation than by meeting the local marine life, out on a lagoon tour, with a friendly Bora Bora photographer to record the fun. Even if you're a non-swimmer you're welcome on Bora Bora Photo & Video aqua tours. You can relax in the lagoon as Stephen will make you feel comfortable – and your Polynesian boatman, who also joins in, was probably born in the water. Our romantic photos in Bora Bora are priceless! So don't be be over-concerned about cost and limit your time. Bora Bora Photo & Video resort shoots can be booked by the hour and, from experience, we recommend at least a 2 hour session. The cost for a photo session at your resort starts at 45000 XPF and guarantees 60 photos. The half day flex package, with a guarantee of 200 photos, is another interesting option, as the photo shoot can be split into some morning and afternoon time, to get gorgeous Bora Bora sunset pictures too. A full day experience with Aqua Photo Tour will cost 125000XPF in 2018 - when booked directly from Bora Bora Photo & Video. This price gives incredible value as it includes all the “must do” activities in Bora Bora – snorkeling at the most popular coral gardens, meeting the rays and sharks, and a traditional Polynesian picnic lunch on a motu – with a charming captain, a Bora Bora photographer, and a hostess, all to yourself. Don't think twice about the price – if there's availability with Bora Bora Photo & Video– grab this once in a lifetime opportunity. Our Bora Bora photo lagoon tour was the best excursion we've ever taken. 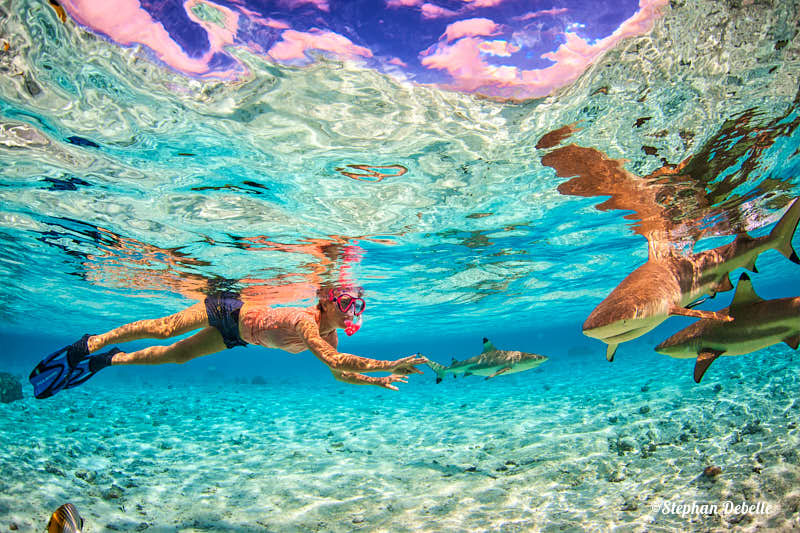 You can skip a typical, group, circle island tour with stops for snorkeling and meeting the sharks and rays; and take a Bora Bora Photo & Video water tour to get memorable photos, highlighting your extraordinary experiences in the world's most famous lagoon. When deciding how much time to book for your Bora Bora photo shoot, keep in mind that Stephan takes inspiration from the couple he is working with. The longer he has with you, the more accurately he can capture “you” and get awesome shots. During our shoot he said that his work isn't over until that's done. He's a passionate artist and you're likely to get more than you pay for. Having a Bora Bora photo shoot and/or tour is now on our list of top things to do in Bora Bora. If you're planning a vacation in Bora Bora, chances are you've been viewing picture-perfect photos of Bora Bora for years. Get yourself in some incredible Bora Bora photos while you're there! Don't rely on selfies or passing your camera to someone walking by - who doesn't know how to use it and where to aim for the best frame. In a place like Bora Bora there often isn’t even anyone walking by! I've found that it can be challenging to get loved ones to relax in photos. When you point the camera they become self-conscious. But while using a talented professional photographer, who knows how to engage and direct you, posing becomes natural – it's a fun thing to do – and the joy shows up in the photographs. The Bora Bora Photo & Video team are flexible about where and what type of photos you want. Stephan has impressive skills and equipment to shoot on land; or above and below the water. Your Bora Bora photo shoot will be individual to you and your wishes. 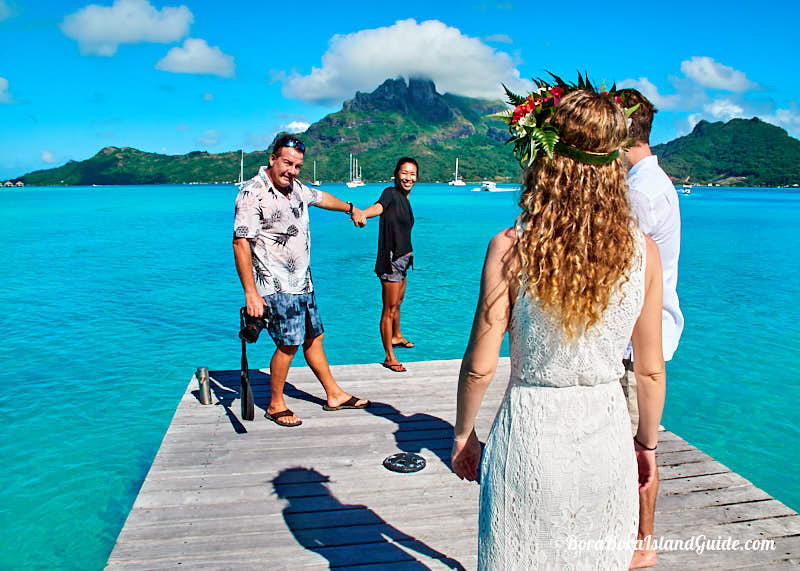 We had the time of our lives, making and capturing memories, while having a Bora Bora photo shoot and aqua shoot day-tour, with the Bora Bora Photo & Video team. We hope to have more of these adventures on our next vacation.